John Vervaele was honored Master of Laws (J.D./LL.M) and Master in Criminology (MA) at the University of Ghent (Belgium). Between 1980 and 1985 he was assistant researcher in criminal law and criminal procedural law at the University of Antwerp (Belgium). From 1985 till 1987 he was senior researcher at the Belgian Ministry of Justice. In 1987 he left for the Dutch Institute for Social and Economic Law Research (NISER) at the University of Utrecht. 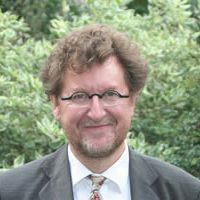 Following the successful defense of his doctorate thesis in 1988 he was in 1990 appointed Assistant Professor in criminal law and criminal procedure and secured the prestigious PIONIER subsidy of the Dutch Council for Scientific Research for the 'Enforcement of European Law' project (1991‑1997). He established in 1991 the Centre for Enforcement of European Law at the University of Utrecht and was subsequently appointed Professor/Director in Law Enforcement and European Integration in 1992. Since 1996 he is also Professor in Economic and Financial Criminal Law at the University of Utrecht. From 2003 on he is vice-dean and director of research of the Utrecht Law School. In 2006 he was nominated vice-president of Utrecht University for Latin America. He is regularly teaching as visiting professor in foreign universities, in Europe and overseas, mostly topics touching upon economic and financial criminal law and European criminal law. He has been teaching as a visiting Professor at Universities in Italy (Rome, Parma, Trento), in Spain (San Sebastian, Salamanca), in Switzerland (Freiburg), in Belgium (Liège), in Colombia (Bogotà, Ibague), in Mexico (D.F) and in the United States (Columbia Law School in New York and American University in Washington DC). From 2014 het is President and Director of the Scientific Committee of the AIDP, the world organization for Criminal Sciences with consultative status with the United Nations and Council of Europe.